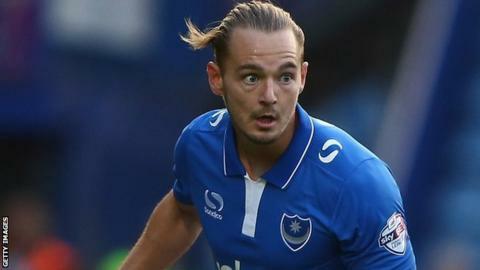 Adam McGurk's long-range equaliser helped 10-man Portsmouth maintain their unbeaten start to the League Two season with a draw at Oxford United. Liam Sercombe fired Oxford ahead from the edge of the box after the visitors failed to clear a corner. McGurk levelled the scores after the break as he thundered a shot into the left-hand corner from 30 yards out. Portsmouth captain Michael Doyle was sent off for a second booking late on, but the hosts could not find a winner. "There were spells where we were really poor, where we lost our way. "I thought we showed a lot more maturity in how we wanted to play in the second half. "There was a spell in the second half where we took total control of the game - unfortunately we couldn't go on and see it out." Match ends, Oxford United 1, Portsmouth 1. Second Half ends, Oxford United 1, Portsmouth 1. Attempt saved. John Mullins (Oxford United) header from the centre of the box is saved in the centre of the goal. Pat Hoban (Oxford United) wins a free kick in the defensive half. Substitution, Portsmouth. Danny Hollands replaces Kyle Bennett. Substitution, Oxford United. Pat Hoban replaces Kemar Roofe. Second yellow card to Michael Doyle (Portsmouth) for a bad foul. Attempt blocked. Kyle Bennett (Portsmouth) left footed shot from the centre of the box is blocked. Adam McGurk (Portsmouth) wins a free kick in the defensive half. Substitution, Oxford United. Josh Ruffels replaces Danny Rose. Attempt missed. Alexander MacDonald (Oxford United) right footed shot from outside the box is close, but misses the top right corner. Danny Rose (Oxford United) wins a free kick in the defensive half. Corner, Portsmouth. Conceded by John Lundstram. Jake Wright (Oxford United) is shown the yellow card for a bad foul. Goal! Oxford United 1, Portsmouth 1. Adam McGurk (Portsmouth) left footed shot from outside the box to the bottom right corner. Corner, Portsmouth. Conceded by Joe Skarz. Attempt missed. Adam McGurk (Portsmouth) header from the centre of the box is just a bit too high. John Lundstram (Oxford United) wins a free kick in the attacking half. Substitution, Portsmouth. Adam Barton replaces Nigel Atangana. Attempt saved. Kemar Roofe (Oxford United) right footed shot from outside the box is saved in the centre of the goal. Second Half begins Oxford United 1, Portsmouth 0. First Half ends, Oxford United 1, Portsmouth 0. Corner, Oxford United. Conceded by Paul Jones. Attempt saved. Kemar Roofe (Oxford United) right footed shot from the centre of the box is saved in the bottom right corner. Attempt missed. Danny Hylton (Oxford United) header from the centre of the box misses to the left following a corner. Corner, Oxford United. Conceded by Ben Davies.